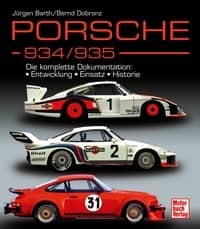 Jürgen Barth,former factory pilot and chief of the Porsche Client Sportsprogram and co-author Bernd Dobronz explain with lot of detail the history of a legendary Porsche 934 and 935. From the development of the first prototypes till the last international race victories of the Porsche 935 in 1984 at the 12 hours of Sebring. The complete book is illustrated with numerous pictures and figures, many of them never published before. Year by year, all changes during the evolution of the cars are explained , so you can see the first chapters of the book as a timeline of the history and development of the cars, including data of the races they competed in. Any sportscqr enthusiast should have this book in his library, not only the Porsche affiionados. There are even copies of the FIA homologation pages and the manuals of both the Porsche 934 and 935 published in the book. Quite intresting as these are highly sought after memorabilia by Porsche literature collectors. Very intresting part of the book, and taking over half of the volume of the book, is the complete know ownership- and race history of each individual car. This makes thebbook extremely valuable as it becomes just like that the one and only reliable source of information that you can have at hands at home when it comes to this legendary racers. There’s absolutely no excuse not to have this book in your library if you are intrested in the race history of the seventies till the mid-eigthies.